Anyway, we stayed at a boutique called Villa Franca, which was gorgeous and chic and perfect for what we were looking for. Considering how pricey it was, I did think the room was small, but that’s pretty standard for Positano, and we were fine with it since we didn’t spend much time indoors. Location-wise it was ideal and it had a stunning restaurant called Li Galli, which I would recommend for breakfast or dinner even if you’re not staying there. As far as other properties: Le Sirenuse is the grande dame and with good reason. You should go for dinner or drinks (more on that below) even if you’re not staying here, just to snoop around and experience it. Sireneuse is also one of the most expensive (same goes for Il San Pietro and Villa TreVille) but if I was going on my honeymoon or looking to *really* splurge, I would have stayed at either of these three. Drooling over this bowl of spaghetti. 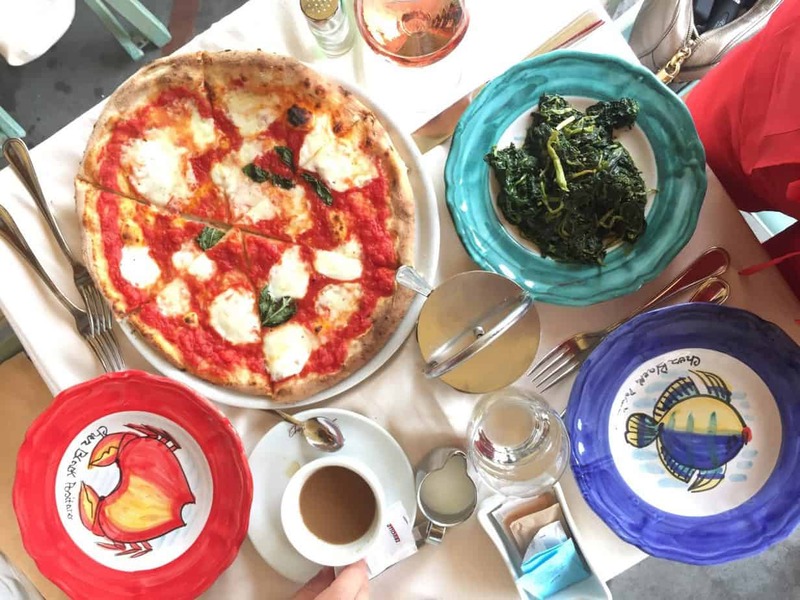 People who have been to Positano have VERY strong opinions about restaurants. 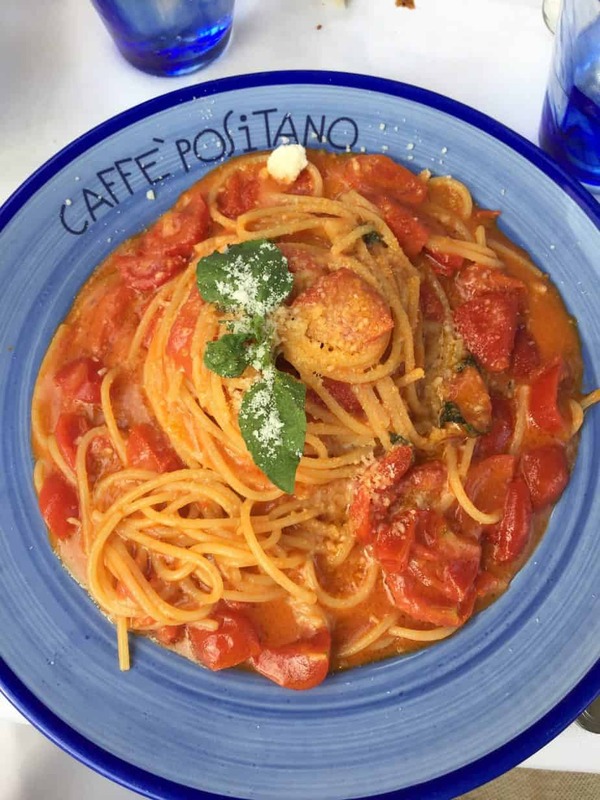 (If you need proof, check out the comments on this Instagram I posted asking for Positano restaurant recommendations.) Below is a list of places we went, and some that we didn’t get to, but came highly recommended. Chez Black: People will either tell you it’s the MOST AMAZING place ever, or that they think it’s totally overhyped. I’m part of the latter camp. I personally don’t think it lives up to the buzz, and I’m glad we didn’t go here for dinner, BUT we did stop by for some pizza, appetizers, and rose one afternoon—which in my opinion, is really the move. It’s located right on the main drag of beach, so you can sit outside in the front and people watch for HOURS. The food was just OK (tbh I’ve had better pizza in New York) but I think it’s worth going for the experience. I just wouldn’t recommend spending a full-blown dinner here. Our meal at Chez Black. Good, not mind-blowing. Go for a pizza at lunch. Next2: Italian / Mediterranean fusion. A bunch of people recommended it and we had a fab meal. Chic, modern vibe and lots of pretty people. La Tagliata: Highly recommend. Super unique. It’s up in the mountains in an area called Montepertuso that’s a 20 minute drive or so from town, but the restaurant sends a van to pick you up. There’s no menu—they bring out whatever it is they decide to cook that day (but from what I’ve heard, it tends to be the same for the most part.) You get an insane amount of food and unlimited wine for around 40 euros per person (plus tip). My only piece of advice is that it’s not great for vegetarians or non-meat eaters, since most of the main courses are meat, and they won’t do substitutions. Reservations can be made via a form on their website or through your hotel. Franco’s: I can not say enough good things about Franco’s—it was probably the highlight of our trip. It’s the new(ish) outdoor bar at Le Sireneuse, the fancy shmancy hotel mentioned above. You absolutely *must* go for sunset. They open at 6pm, but if you start hovering outside of the entrance a bit before 6pm, you’ll be one of the first people in and you can snag a table by the ledge, which is CRUCIAL. Also, it’s fairly small so the space fills up fast, and there ends up being a decent wait on most nights. Order an aperol spritz and eat as many giant green olives (truly the best I’ve ever had) and almonds as you can. At Franco’s order the aperol spritz. Trust. On the Rocks: I may not be a partier like I was in my early 20s, but you better believe I’m all about going to a club to check out the local scene when I’m visiting a new place for the first time. Enter: On the Rocks. As far as I know, it’s really the only “club” in Positano. And it’s sick! Basically it’s a club carved into the side of the mountain—hence the name “on the rocks.” In true European fashion, it doesn’t get going until super late—I think we went on a Saturday after midnight, at like 12:30/12:45—and we had SO much fun. It’s eurotrashy in the best way possible. Things got slightly blurry for me toward the end, but I do recall confetti, smoke machines, tequila, and an amazing DJ. I’ll leave it at that. I read a bunch of reviews before we went and heard that the bouncers can be assholes at times, but I think if you look presentable and are polite, you should be fine. Can’t remember if we paid a cover or not. If we did, it was worth it. Don’t wear heels unless you’re taking a cab directly to or from dinner. The streets are cobblestone and there are a million steps (my thighs were literally so sore after three days I could barely walk.) On the bright side, you’ll burn off all of the carbs you eat by walking so much. Expect it to be touristy. I think it’s important to realize before you go that Positano is a tourist-heavy destination. Don’t expect a super authentic local experience. The majority of the people around you aren’t locals—and that’s fine because it’s so gorg and chic! But just be mindful of it ahead of time. Hi! Thanks for the recs. Going for our honeymoon in soetember! I was wondering how many nights did you stay? And did you visit anywhere else on the Almafi Coast with deets you can share? Love it! 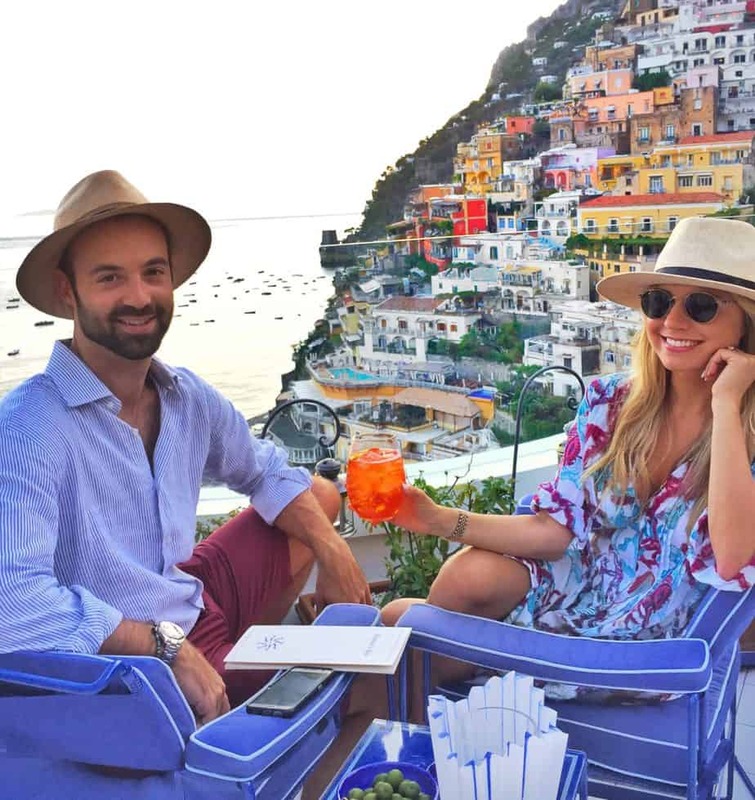 We did Positano for 3 nights and Capri for 2 nights. 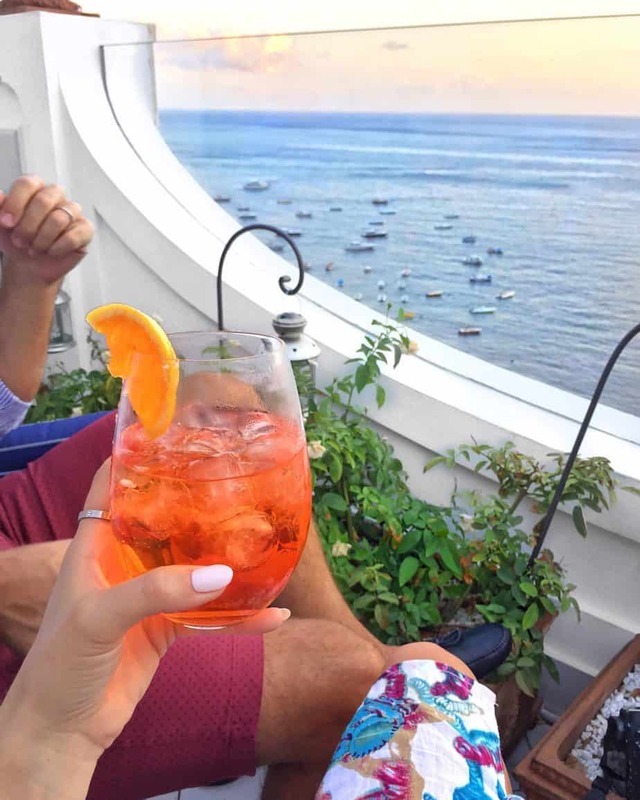 We looooved Capri and wish we had flipped it (2 in Positano, 3 in Capri.) People also say amazing things about Ravello, but we didn’t get there. After Amalfi we went to Lake Como for 3 nights! A little delayed here 🙂 Where did you stay in Capri?/Lake Como? Looking to do about the same trip! In Capri we stayed at Capri Palace (Anacapri) – a little far from the center of town but SO beautiful. In Lake Como we stayed at Villa d’Este, but also checked out Grand Tremezzo, which looked amazing too! We actually went the first week of September and it was amazing! I’d highly recommend it – even later in the month is great too.